DIMITRI VAN DEN BERGH hit a stunning nine-dart finish in his 10-6 win over Stephen Bunting to progress to the quarter-finals of the bwin Grand Slam of Darts. Van den Bergh landed the fourth perfect leg seen at the tournament, and the first since 2015, to net the £25,000 prize on the opening night of the knockout stage in Wolverhampton. The Belgian World Youth Champion, who led for most of the contest, went within a leg of victory with the nine-darter before regaining his composure to seal one of the biggest wins of his career. 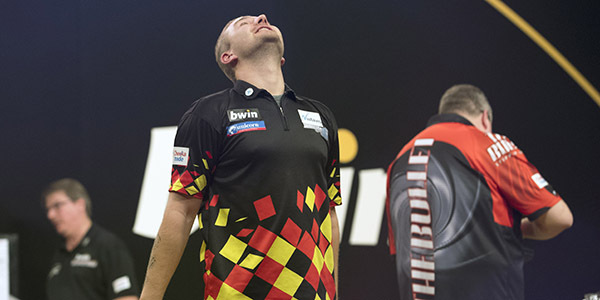 "I still don't know what happened, it's unbelievable," said World Championship quarter-finalist Van den Bergh. "Watching the nine-darter back it feels surreal to see myself hitting a it on stage, I can't believe it's me doing it! "I'm over the moon to hit my first perfect leg on such a magnificent stage and I also have to thank the crowd because they helped me hit the double 12. "I haven't played my best game yet either so maybe this is the tournament where everything will fall for me, and I've got to keep believing in myself and prepare for my next game." Van den Bergh will now take on Mensur Suljovic after the Austrian dumped out World Champion Rob Cross with a 10-7 win. Suljovic raced into a 4-1 lead before Cross fought his way back into the contest to trail 7-8, but Suljovic punished his missed doubles to win the match with a 96 finish. 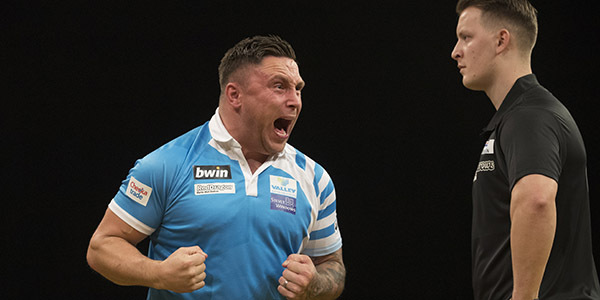 Gerwyn Price reached his eighth TV quarter-final of the year thanks to a 10-5 victory over Josh Payne. With the match finely poised at 5-5, Group F winner Price reeled off the final five legs to reach the last eight for the first time. The Welshman will now face Simon Whitlock following the Australian's 10-6 triumph over last year's runner-up Peter Wright. European Championship runner-up Whitlock, who hit two 170 finishes to qualify from Group F in dramatic style, came close to his third of the tournament in a game which saw him take a 3-2 lead which he never relinquished. The knockout stage continues on Thursday with players who qualified from Groups A-D returning to the stage, including a mouth-watering clash between Michael van Gerwen and Michael Smith. Two-time World Champion Gary Anderson plays Dutchman Wesley Harms, in-form James Wade meets Michael Unterbuchner and Wales' Jonny Clayton takes on emerging Polish star Krzysztof Ratajski.